Eds. note: Content in this post launched a discussion at Heavy Medal at School Library Journal. Please see A Native Perspective of The Hired Girl for an in-depth review that incorporates what I've said below. This is one of those posts people are gonna object to because it is one of the "one liners" -- which means that the book has nothing to do with Native people, but there is a line in it that I am pointing out. It is "one line" to some, but to Native people or anyone who pays attention to ways that Native people are depicted in children's and young adult literature, those "one lines" add up to a very long list in which we are misrepresented. "No, ma'am," I said. I was as taken aback as if she'd asked me if I was an Indian. It seemed to me--I mean, it doesn't now, but it did then--as though Jewish people were like Indians: people from long ago; people in books. I know there are Indians out West, but they're civilized now, and wear ordinary clothes. In the same way, I guess I knew there were still Jews, but I never expected to meet any. Let's look closely at what Joan said. The word 'are' in "I know there are Indians out West..." is in italics. I like that, because I often speak/write of the importance of tense. Most people use past tense when speaking or writing about Native peoples, but we're still here. But then, Joan thinks "they're civilized now." Does that mean Joan buys into the idea of the primitive Indian who became "civilized" by contact with White people? Do the "ordinary clothes" they wear mean they're civilized? I'm pretty sure people are going to say that--in asking those two questions--I'm not leaving room for people to do well, or try well, in their writing about Native people. The fact is, this book is already succeeding and so are ones I've written about before. This post* isn't going to hurt it, but if it does give people (who read AICL) the opportunity to think about words they use in their own writing, that is a plus for all of us. Native peoples in the U.S. were living in well-ordered societies when Europeans came here. We weren't primitive. Indeed, European heads of state recognized the Native Nations as nations of people. That's why there are treaties. Heads of state, then and now, meet with other heads of state in diplomatic negotiations. Saying "well, Joan didn't know that" is a cop out. She could have known it. Plenty of people did! She's a fictional character. She can know whatever Schlitz wants her to know. *Replaced "My lone voice" with "This post" in hopes that I'll find other writing that points to this particular passage. Eds. note (10/2/2015): See update at bottom. It appears the change is only to the U.S. edition. For those who don't know the book, the main character is a girl named Grace who wants to be Peter Pan in the play her class is going to do. Other kids tell her she can't be Peter because she's a girl and he's a boy, and, that she's Black and he's White. Stung--as any kid would be--she imagines herself in all kinds of roles, including Hiawatha. 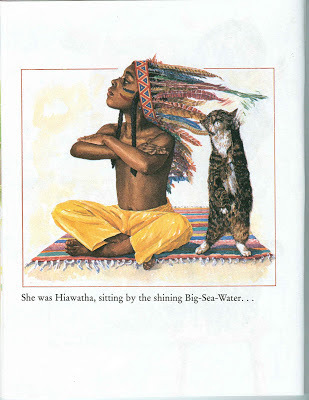 That she's "by the shining Big-Sea-Water" tells us she is imagining herself as the Hiawatha of Longfellow's imagination (there was, in fact, a real person named Hiawatha). But see how Grace "plays" Hiawatha? In a stereotypical way. She sits cross legged, torso bare, arms crossed and raised up (I don't know why so many statues show Indians with arms crossed and lifted off the chest that way), barefoot, with a painted face and stoic look. Are the book's multiple themes so welcome that the act of "playing Indian" escaped comment by most U.S. reviewers...that critics relaxed their standards for evaluation? No, such images recur so frequently that when they do, nobody notices. Well, almost nobody but the children who in real life are Indian. Claiming that only American Indian children are apt to notice "playing Indian," "sitting Indian style," or picture book animals "dressed up" like American Indians does not excuse the basic mistake. Self-esteem is decreased for the affected peoples, an accurate portrayals are skewed for everyone else. This change is big news in children's literature. I'm grateful to Roger for sharing it. But let's return to his words. Roger suggested that the absence of Grace/Hiawatha in the new edition is the result of "public shaming." Its absence can be seen as the result of public shaming---but it also be seen as a a step forward in what we give to children. Might we say it is gone because its author, illustrator, and publisher decided that the self-esteem of Native children matters? And, maybe, they decided that having it in there was a disservice to non-Native readers, too, skewing what they know about Native peoples? Maybe they just decided it was dated, and in an effort to market the book to today's readers, that page would hurt sales. Today, I wish I was near Ginny's hometown. I'd call her and see if she wanted to join me for a cup of tea. I'm sure it'd be a delightful conversation. The double-page that shows Grace as Hiawatha and then as ‘Mowgli in the back garden jungle’ does, however, need to be held up as a reminder that breadth of experience through reading is important for young children: whilst Grace’s story highlights a can-do attitude and the notion that you can be whatever you want to be because of what you do not what you are, the stereotypes that have been passed down through some of these classic stories can only be broken by ensuring that children read contemporary stories set within the cultures they represent. There is still too much of a dislocation in the UK between dressing up in a feathered headdress with a painted face and awareness of how that sits within contemporary Native American culture. I guess that the people involved in the 25th anniversary edition think it is ok to let kids in the UK have that page. Obviously, I disagree. This, however, is familiar. In 2010, a British production of Peter Pan was slated for Canada. Changes were made to it in an effort to be sensitive to First Nations people. Given the debased depictions of Native peoples in kids books imported from the UK to the US, I think it is wrong to leave that page in Amazing Grace. Worse than wrong, actually. It is a disservice to the children whose stereotypical ideas of Native people are affirmed by that page, and a disservice to those who learn that image for the first time, when they read Amazing Grace.